The term “a parallel” covers so much and yet so little. The word is often used in culture, politics, and economy, in order to compare and at the same time – to show the common, the conjunctive, the similarly and yet individually reflective. It makes us think about the parallel nature, parallel expressions, parallel lives. 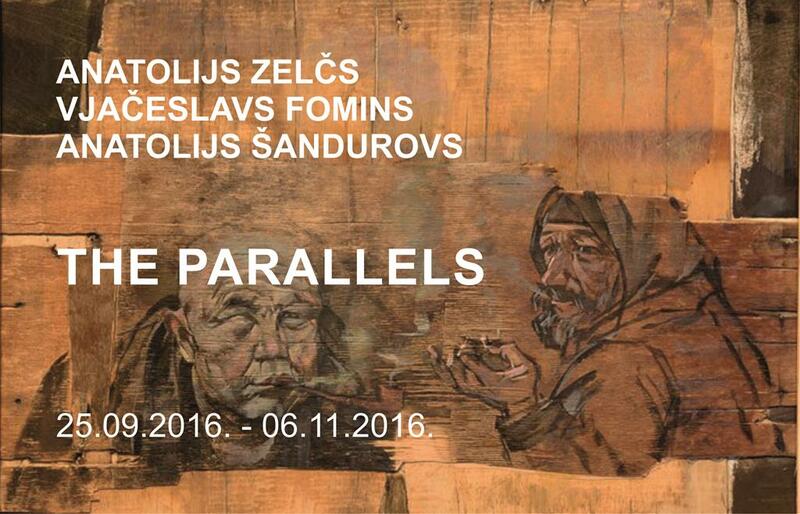 Conceptually, the exhibition “PARALLELS” by three men – artists Anatolijs Zelčs, Vjačeslavs Fomins, Anatolijs Šandurovs brings together three artists with different styles. As acknowledged by the artists themselves, the idea of the exhibition came partly intentionally, partly accidentally. The common parallels for the artists are teaching at the Art Academy of Latvia, the rhythm of life, and – in some sense – a different expression in art, where parallels can be sensed in their way of thinking. Another parallel that joins the artists is Latgale. Anatolijs Zelčs was born on 14 April 1964 in Tilžas, Balvi District. From 1980 to 1984 he studied at the Department of Ceramics of Rēzekne Art School. In 1987 he began studies at the Art Academy of Latvia, Faculty of Painting. In parallel with his studies, he worked at the perfumery factory “Dzintars” as a designer and also taught at Riga College of Applied Art. After graduation in 1993, he moved to the city of his youth – Rēzekne, where he headed the Division of Visual Plastic Art of Rēzekne Art and Design Secondary School, and later taught at Latgale Branch of the Art Academy of Latvia, where he still works as an associate professor. He also received training (in 1998) at the Russian Academy of Arts in Saint Petersburg, I. Repin St. Petersburg State Academy Institute of Painting, Sculpture and Architecture, Departments of Painting, Restoration and Sacred Art. His artistic work begun in 1988 and since then his works have been exhibited in more than 50 exhibitions in Latvia and abroad. He is a member of the Latvian Artists’ Union. He actively participates in the art life of Latvia both at national and regional level. Vjačeslavs Fomins was born on 20 February 1976, in Ludza. He graduated from Rēzekne Art and Design Secondary School as a wood sculptor and a teacher of visual arts. After graduation from the Art Academy of Latvia and receiving Master’s Degree in Graphics, he started to work at Latgale Branch of the Art Academy of Latvia teaching engraving and printing. Since 1997, he actively participates in various local and international exhibitions, plenaries and other art projects. From September 2003, he actively participates in the work of J. Soikāns Ludza Art School where he teaches plastering, drawing, and graphics. Since 2006, he is an assistant professor at Latgale Branch of the Art Academy of Latvia and a head of the Graphics Department. Anatolijs Šandurovs was born in 1972. After graduation from J. Rozentāls Riga Art School, he was enrolled at the Art Academy of Latvia where he studied at the Graphics Department. He works at the AAL and teaches lithography, while taking part in exhibitions as from 1995. Since 2005, Anatolijs is a member of Latvian Artists’ Union. Anatoly is reticent about his art. Instead, he encourages viewers to engage in conversation about parallels by offering his works which were created especially for this exhibition at Mark Rothko Art Centre.